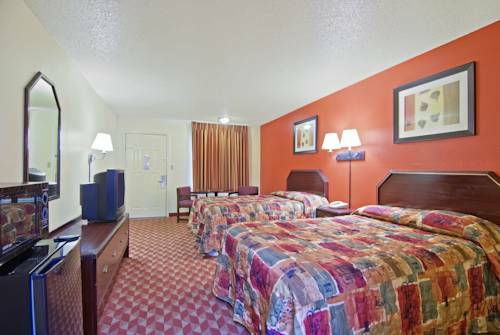 Welcome to Americas Best Value Inn and Suites Prescott conveniently located off of Interstate 30. Disconnect from the hustle and bustle of everyday life and reconnect with friends and family while taking in the natural beauty of Arkansas. Visit local attractions including President Bill Clintons Birthplace and Boyhood Home Prescott Country Club Historic Washington State Park Crater of Diamonds State Park Nevada County Depot and Museum Prairie DeAnn Battlefield Old Mural Elkins Ferry Battlefield and Prescott Raceway Park. Enjoy a meal at one of the restaurants located less than 4 miles from our hotel including Mama Maxines Broadway Cafe Flamingo Grill Broadway Cafe and Pizza Hut..While staying at Americas Best Value Inn and Suites Prescott treat yourself to our free continental breakfast. Non-smoking rooms are available. All guest rooms feature wireless high-speed Internet access and satellite TV with HBO. Some guest rooms also offer a writing desk. Our 24-hour staff is here to make our FEMA approved hotel your home away from home. Pets are allowed/restrictions apply. At Americas Best Value Inn and Suite Prescott Weve Got You Covered from the time you hit the road until your head hits the pillow. Americas Best Value Inn and Suites Prescott is conveniently located off of AR-24-US-371 W. Our address is 1703 Highway 371 West/ Prescott Arkansas 71857.